High quality, alcohol-free and hypoallergenic. These gentle baby wipes are great for cleaning dirty hands wiping faces, and cleaning spills. With a count of 576, you won't find a better deal when it comes to high quality wipes. (That's around 2 cents per wipe). 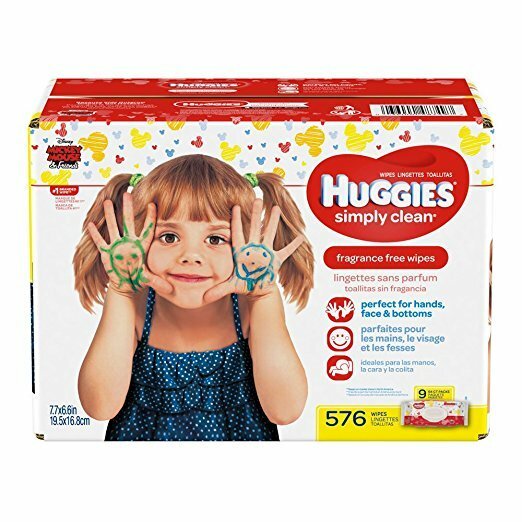 Hypoallergenic and alcohol free, you can use HUGGIES with trust. Confession: I am not a baby, but I love these wipes. They are great for wiping my hands after eating. These are heavy duty wipes, and resistant to ripping. However, despite their durability, HUGGIES still manages to make incredibly soft wipes that are gentle on the hands. I recommend these for people of any age.